As you flip through the pages of Food52’s new cookbook Mighty Salads, you’ll notice right away that fresh produce is at the heart of any mighty salad—whether it’s a leafy salad strewn with grilled mushrooms and figs, a couscous salad that puts spring’s best baby artichokes center stage, or a steak salad made whimsical by a tangle of peppery greens, herbs, and charred red onions. Shopping for beautiful produce is often the easy (and fun) part, especially at the height of the growing season when farmers markets are spilling over with ripe peaches, fat tomatoes, and zucchinis galore. But after you get your bounty home, that’s when reality sinks in. You may wonder: What was I thinking? I bought enough produce for a family of eight, not four! How can I fit all of this into my refrigerator? Should I just take a nap now? I faced these questions many times over in the process of developing new recipes for Mighty Salads. Before diving into this project, I was a little lackadaisical about produce storage. But with 30 recipes to create (and test, and test again) over a six-month period, I had to be more intentional about creating strategies that allowed me to do my shopping over the weekends, and make Mighty Salads all week long. 1. What steps need to be taken as soon as I get my produce home (e.g. washing)? 2. What is the best storage method for each type of produce to ensure maximum freshness? Remove twisty ties, rubber bands, or other fasteners from your produce to prevent bruising and poor circulation. Hold off on washing or cutting produce ahead of time because it’ll deteriorate faster. (One exception is berries, believe it or not! They’ll last longer if given a diluted vinegar bath.) If pre-washed and ready-to-go produce makes meal prep easier, then go for it—just know that your produce won’t last as long. I typically limit my pre-washing to sturdy, leafy greens (kale, Swiss chard, collard greens, and the like) because I’m much more likely to grab them mid-week if I’ve washed and separated the leaves from the stems. I don’t recommend pre-washing tender greens (like watercress or mache) or soft herbs—their leaves are too delicate to withstand multiple handlings or any trapped moisture. If you choose to pre-wash, make sure to dry produce as well as possible; a salad spinner makes quick work of this step. There are three places to store produce: the fridge, the countertop, or a cool room or pantry. Each fruit or vegetable has its own preferred place. Most vegetables need a slightly humid yet breathable environment to stay fresh, and are happier if stored in something versus tossed in the fridge. (Note: If your tender greens still have the roots attached, wrap them in a damp paper towel before storing them.) Below are three storage options for the fridge that all work. Mesh or cloth bags. Food52 recently sent me some of Vejibags' Fresh Vegetable Storage Bags to test (newly available in their Shop! ), in a few different sizes. To use them, you wet the bag, wring it so it is just damp, then place your produce (washed or not) inside. Made from organic cotton, they’ve kept my produce fresher, for longer, than plastic storage bags due to their breathability. I prefer the x-large size, because it’s big enough for even monster-sized bunches of chard or collards. The key to success with these bags is keeping them damp by sprinkling them with water every few days. Plastic storage bags. Toss the thin grocery store produce bags unless you’re using the contents within a day; they’re too porous to hold in moisture and keep produce fresh. Plastic sealable storage bags, in either quart or gallon-size, work well. If I’ve pre-washed my produce, I usually nestle a dry paper towel down in the bag to wick up excess moisture—and I’ll do the opposite by inserting a damp paper towel when I haven’t pre-washed. It’s important to leave the plastic bag partially unsealed, or poke holes in it so moisture isn’t trapped. And absolutely re-use your plastic bags! Rinse them after using if needed, and put them to use again and again. Salad spinner. As Kristen wrote about here, if you can make room in your fridge for a salad spinner, lettuces and delicate salad greens will last up to a month. I’m 100 percent confident that this method works, but sadly, I’ve never had the opportunity to try it out because there’s never, ever enough room in my fridge. Once you've decided on your storage vessel, into the fridge your produce goes. But not all areas of the fridge are created equal, and there is a strategy to using the space wisely. The crisper, the coldest and most humid part of the refrigerator, is valuable real estate. These are the vegetables (stored in the aformentioned cloth or plastic bag) that get first dibs in mine: broccoli, cauliflower, celery, corn (with husks), green beans, and leafy greens. And did you know that celery does best when wrapped in foil? Neither did I until reading this article. The top shelves near the front are the warmest part of the fridge. Keep your bagged cucumbers, peppers, and zucchini there, as they are the most sensitive to cold temperatures. Some vegetables prefer a little more TLC. For the happiest asparagus and scallions, treat them like fresh flowers by storing them upright in a jar, with the ends submerged in a small amount of water and the tops loosely draped with an inverted plastic bag. The same idea applies for many herbs. Pack your produce as loosely as you can in the fridge, and store fruit and vegetables separately. Most fruit releases ethylene gas which will cause produce in close proximity to spoil and lose flavor. If you’ve bought packaged produce, such as bagged or boxed lettuce, there’s typically no need to transfer them to new packaging. And one word of advice on that triple-washed lettuce: yes, wash it before eating. I know it’s tempting to use it straight from the bag, but packaged lettuces can harbor harmful bacteria. Plus, a dunk in cold water will crisp it up. For a particularly big haul from the market, put a sticky note on your fridge listing all of the produce you need to use up, in order of perishability. (Or maybe there’s an app that does this? If not, there should be!) Check out this nifty chart for which produce you should eat first. If you’re like me, despite my best intentions, something is likely to get pushed to the back of the fridge where it’s forgotten. I find it’s helpful to rearrange the produce in my fridge every few days, to make sure I’ve accounted for everything. Most fruit—avocados, peaches, cantaloupe, pineapple, etc.—should be left on the counter to ripen (in a pretty bowl perhaps?). You can transfer fully ripe fruit to the fridge to prolong its freshness, but return it to room temperature before consuming for best flavor. And should you ever refrigerate tomatoes? This article lays out pretty compelling evidence that refrigeration does minimal harm once tomatoes are fully ripe. But I’ll admit, I can’t bring myself to put any tomatoes in the fridge. Confused about whether or not to refrigerate citrus? Me too. According to this article, the bottom line is that it’s fine to refrigerate, but like the fruits above, citrus tastes best when returned to room temperature. I find this last step of taking the chill off more important for oranges and tangerines I’m eating out of hand, versus lemons and limes I’m using as part of a recipe. Eggplant should be stored on the countertop rather than in the fridge, which I’ll admit doesn’t seem intuitive. If exposed to cold temperatures, eggplant’s texture and flavor deteriorate quickly. Just make sure your eggplant has some personal space on the countertop away from tomatoes, avocados, and other fruit that produce ethylene gas. Moisture is the enemy for most fruit and vegetables that need cool storage. Remember to keep fruit and vegetables separate (and potatoes and onions, too) to prolong freshness, and store in a cardboard box or basket lined with newspaper to absorb any moisture until you’re ready to use. Apples are a bit more forgiving of the cool, dry storage rule: they also fare well in the crisper drawer, draped loosely with a damp paper towel. Even when fastidiously following all of these rules-of-thumb, life just has a habit of getting in the way. 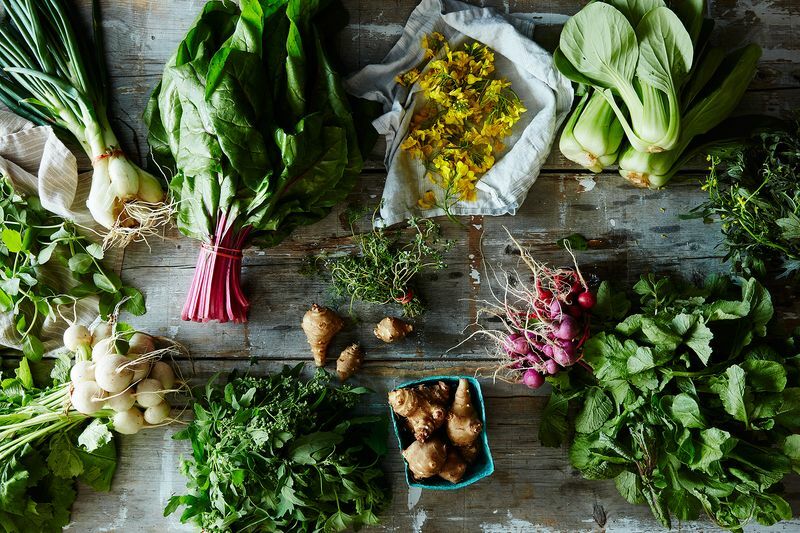 If you open your fridge to discover wilting greens or produce that’s quickly going downhill (but hasn’t spoiled or gone slimy), you still have options! Try reviving greens, herbs, radishes, and more by soaking them in icy water for about 15 to 20 minutes. Slicing them first will maximize water absorption and crispness. Pound greens and herbs into a green sauce or pesto (this kale salsa verde and Genius herb jam are two favorites of mine). Fry herbs for mighty salads! Hot oil doesn’t discriminate between perfect and not-so-perfect herbs. Or even easier, make herb oil by whirling wilty herbs with olive oil in a blender. Make a big batch of vegetable soup or stock. Roast (or simmer) root vegetables until tender, then purée or coarsely mash. Make Genius roasted applesauce (with all apples or a mix of apples and pears). If all else fails, then compost! Head here for 3 ways to start composting.